The charity is also offering businesses advice on how to encourage their workforce to become more active as well as promoting everyday walking after figures revealed the average working-age adult sits for 9.5 hours a day. Ian Findlay, chief officer at Paths for All, said: “Walking is one of the simplest and best things we can do for our physical and mental health. It’s free, you don’t need any special equipment, and it can be easily incorporated into the average working day. Employers will be rewarded in working towards the award through hosting active meetings, lunchtime walks, standing desks and promoting the ways in which to get to and from work by foot. 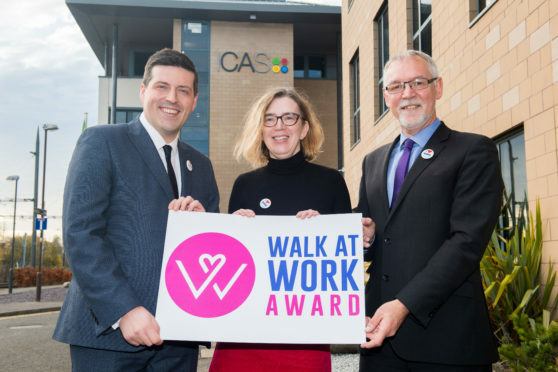 Minister for Business, Fair Work and Skills, Jamie Hepburn said: “This award will reward employers who encourage regular walks, breaks from the desk and activity during the working day. “It will also offer support to businesses who are interested in helping their staff become more active but perhaps don’t know where to start.